We are thrilled to announce that our next seminar will be about how you can customize your email signatures. This is our first Lunchtime Internet Marketing Seminar that will be held 11:30AM-1:00PM. The cost to attend is $10 and lunch is included. Sandwiches will be provided by Belgio’s in Naperville. Professional email signatures are not limited to branding, they also apply to inbound marketing. 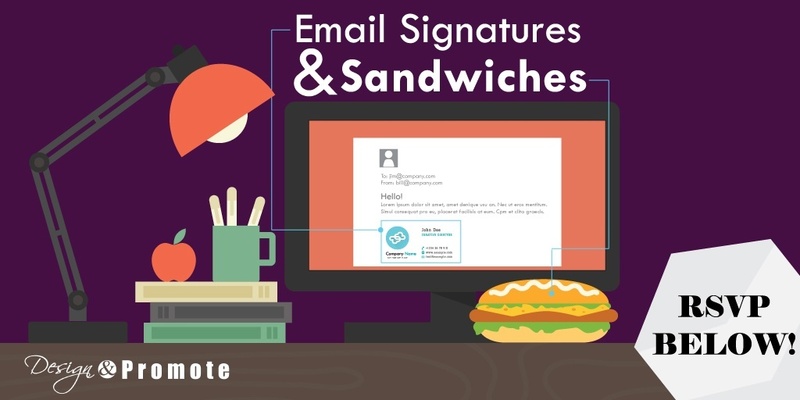 Plus, email signatures are really simple to set up once you learn how! We’ll cover how you can use your email signature to drive traffic to your website, social media profiles, and blog posts. Still sending out emails that say “Sent from my iPhone”? After this seminar, you’ll know where to look to set up your email signature on an iPhone, iPad and Android. Some mobile devices are set up differently, but tips may still apply. Extra bonus: FREE email signature review. Send us your email signatures! We’ll include it in our presentation and provide you with some feedback. This presentation has passed. You can download the slides to this presentation here.